Home & Gold - Get Both This Gudi Padwa! The history and culture of India have witnessed the fact that we Indians tend to leave the most important tasks to the auspicious days where the blessings from the abode above are on a high and the chances of things going wrong are the least or even, negligible. Traditionally, we Indians would always prefer buying a house during some auspicious time and make the most of any opportune festival or moment. The emotional connect that homebuyers hold with any properties purchased on these special days is always unbreakable which majorly contributes to a lot of inquiries and transactions at this time of the year. While you would agree that you, too, have postponed some important tasks or new beginnings to the auspicious season coming up right now, it is already about time you begin because Ashray Group is here with a special Gudi Padwa offer for you! Gudi Padwa, which refers to the beginning of a new year, is considered the most auspicious occasion for any community to either buy or book a home. Since a vast section of Indian homebuyers is religiously inclined, it is also an opportune time for real estate developers in Mumbai to attract prospective buyers by offering special discounts and schemes. Keep reading till the end to find out what offers and incentives Ashray Group has in store for you this Gudi Padwa season! With this blog, Ashray Group explains why this particular Gudi Padwa festival is the right time for fence sitters to invest in real estate. Post demonetisation, the realty sector is slowly and steadily reviving itself like before. Also, with the sudden change in tax policies and the keen watch being kept on any sort of illegal or unethical purchases, the buyers are now getting ready to invest in real estate and reap fixed returns. And what would be a better period than Gudi Padwa to set the ball rolling for the industry that was reeling under a slowdown, right? Developers have often banked upon auspicious occasions to increase their bookings. "This Gudi Padwa is no different, except for the fact that the real estate market has been sluggish post demonetisation and the bookings did come down by an average of 30 to 40 percent,“ says Kalpesh Dave, head corporate planning and strategy, Aspire Housing Finance Corporation Ltd. But things are slowly changing now, especially with the auspicious festive season approaching. This year, Gudi Padwa has come after a very positive union budget, which promotes affordable housing in an unprecedented way. “The home rates have not increased much in the last 12 months. The bank interest rates on home loans are set to go down, thus improving the purchasing power of customers. The Pradhan Mantri Aawas Yojana offers a huge benefit to first time home buyers. This has created a lot of positivity in the affordable real estate market,“ says Amit Haware, CEO and joint MD, Haware Properties. Along with that, the change in the provisions of the deemed let out property and income from house property ensure not just less tax burden but also the liberty to invest in and secure your future in real estate sector. Additionally, it has been pointed out how the government has taken several measures in the union budget such as reducing the holding period of long-term capital gains tax on the sale of immovable assets and giving a one year tax holiday on the notional rental income post the completion of the project, which is expected to provide a boost to the real estate sector. With the central government taking bold steps for the real estate sector like RERA, GST and the new housing scheme in the union budget this year, experts believe that the demonetisation effect has been overshadowed, thereby setting the tempo for investing in real estate. The top real estate developers in Mumbai eye auspicious occasions such as Navratri, Gudi Padwa and Diwali to enhance their prospective buyer base. Past trend highlights that even before such festive season begins, developers across Mumbai, Pune, Nasik and all along Maharashtra lay down the groundwork for their respective offers and discount deals. Offers like customised and easy payment schemes, low-interest rates on loans and cashback offers are often clubbed with conventional discounts. Such special discounts can help prospective buyers save a huge amount on the total value of the property. Also, with a wide range of discount options to choose from, buyers can book a flat even if they do not get immediate possession. Keep reading till the end to find out what offers and incentives Ashray Group has in store for you this Gudi Padwa season! With the Reserve Bank of India (RBI) pushing banks to lower their home loan interest rates, this is the best time to buy and invest in real estate, suggests Ashish Puravankara, Managing Director, Puravankara Ltd. Additionally, a few home loan lenders in the big ticket segment, have come up with attractive offers this time apart from lower interest rates, such as Equated Monthly Instalment (EMI) holidays as well as a waiver of processing fees and documentation charges. This Gudi Padwa has come after an optimistic Union Budget, which promotes affordable housing in an unparalleled way. With the Centre conferring infrastructure status to affordable housing, real estate giants such as Tata Housing are looking forward to building budget homes. The inventory stockpile and post-demonetisation impact have presented the prospective home buyers with an opportunity to negotiate further and choose from a variety of housing options. Post the Centre’s demonetisation move, bookings came down in the state by an average of 30 percent. The luxury housing segment has witnessed a significant fall in prices on the back of the high currency ban, making it one of the most lucrative segments to invest in. Experts share that the sector, which has been severely hit over the last quarter, relies on festive days like these for a much-needed push. This is why a few developers are going the extra mile, offering schemes such as free gold coins, a family holiday, free furniture, fully-furnished kitchens, or offering to bear the stamp duty charges. Keep reading till the end to find out what offers and incentives Ashray Group has in store for you this Gudi Padwa season! 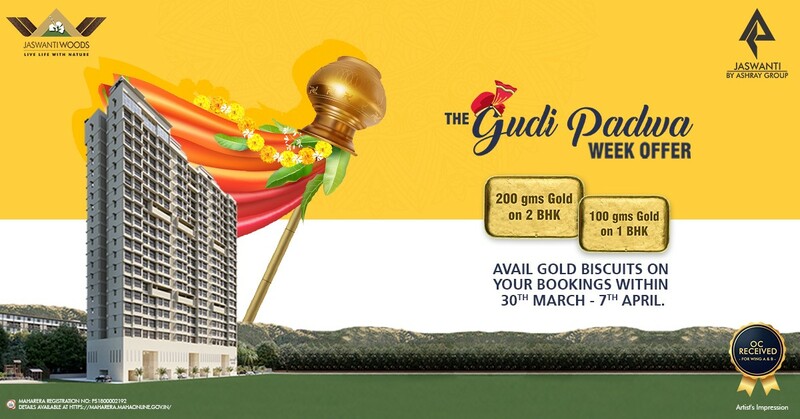 This auspicious season of Gudi Padwa, Ashray Group, Jaswanti Woods will be offering you Gold Biscuit weighing 100 gms on booking a 1 BHK & 200 gms on booking 2 BHK. The offer is valid on your booking between 30th March 2019 to 7th April 2019. Planning to buy something but don’t have any good property in mind? Jaswanti Woods, a Mulund based residential project of Ashray Group that is nearing completion with OC received for A & B wing is a perfect blend of accommodation with amenities like multipurpose court, yoga area, gym, stargazing deck, etc. Having a Vastu Compliant design, the property also offers you a Strategic Location, 1 & 2 BHK Affordable Luxurious Apartments, Meditation Area, Children's Play Area, Landscaped Garden, Senior Citizens Corner and a Fully equipped Gymnasium. Ashray Group’s Jaswanti Woods project has also won the ‘Iconic Eco-friendly Project of the Year 2018’ Award at the Mid-day Real Estate Icon Awards in December 2018. So what are you waiting for? Act fast before the offer expires!